Since yesterday I brought them up, here they are. Something pink this way comes. Amanda and some other bloggers discuss what it means to be in luck and how to bring it about, luck. Some would call this winning the lottery, I call it grocery shopping. ADD-IT: I should explain that this is not just a hyperbole or what not, but that there really is a Coop right next to the lagoon where I buy my groceries. For Valentine’s Day they organise flamingo-mating dance viewing from the roof. Truth! 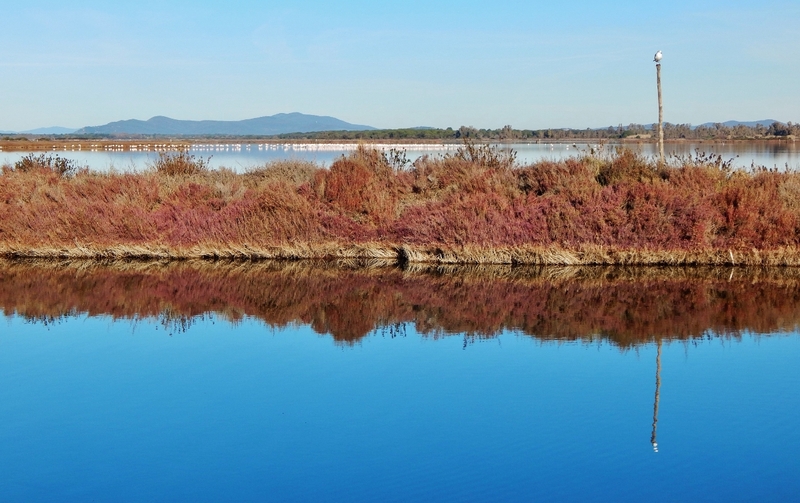 This is one minute in the life of little Manja and her pinkish flamingos by the Orbetello lagoon. These four photos were taken back to back. Something startled them and I was thinking they could smell bestia but we were really far. I was also hoping some of them would take off but alas in two minutes they went back to chilling, which is what they do here until the end of February or so when they take off for good until the next winter, as I mention in my yesterday’s poem. The last photo shows you how far they really are. Just as well. This is a nature reserve, after all. It is us who are visiting. Amazing. What a thing to see! And that last shot with the colour of the grass and the water. That has made my Sunday! Ahh, glad to hear, Gavin, thanks! I added a paragraph explaining that there really is a supermarket where I buy my groceries right next to this lagoon. I wasn’t just being cute. You live by such outstanding beauty. Wow! My supermarket look out onto a road and a carpark. Thank you, Bojana. It really is. And considerably empty of people, except in the summer months. Wow, I was totally ignorant of there being flamingos in Italy! What a sight! Indeed, Leya, thank you! I heard before coming here that they were in Sardegna too. I should study a bit where they come from, but obviously this is their winter resort. They come every year in the autumn. There are many and make a peculiar sound before dusk. I love flamingos – saw some in the Galápagos archipelago, but never in Italy! You gotta love those flamingos. I do, I do! 🙂 Thank you, Jan! An incredible sight. I love the way you captured their heads popping up in unison, when they spotted you or something that caught their attention. I never knew you had such gorgeous birds in Italy. Thanks for educating me. Oh, Amanda, you’re most welcome. They are just visiting for the winter and return every year. I don’t know where they come from and where they go, I should study the matter a bit. That is intruguing. I only have ever seen them in the Singapore zoo. I also would like to know about their native habitat. I remember the first and I think only time I ever saw flamingos, in Florida in 1963 or so. I was very young and astonished at the sight but accepting as little kids are. Well, your photos prove they are magic after all! Thank you, Claudia. 🙂 It just feels so good to be in a place where so many of these feathery friends would choose to winter, repeatedly. Lucky is how I feel all the time. I basically live in a nature reserve, or right next to it. Thanks! Very 80’s indeed, SMSW. 😀 Thanks! Oooh, I love them! I go to the grocery store every day, but I might go more than once if that were the scenery nearby! Good to see you here, Lexi, I was thinking of you just yesterday. I hope this year has been kind to you so far. Well, this shop is 15 min drive away, but we go there once a week. It’s quite enough. Around here it’s just beautiful, everywhere you look. I agree with Lex, if this was the sight from my grocery store, I would certainly be inspired to go more often, even though it is one task in life I can’t stand. Your photos are beautiful, and I am especially impressed when you gave us the perspective shot at the end. All that while in mega-zoom! True, the zoom reached the limit right where they stood. They are quite far and yet you can hear them make a collective sound as the dusk nears. It’s amazing… Thank you, Crystal. I took many photos of them in the five winters since I arrived here but this time the light and visibility were best. Also, I only go there once a week even though it’s only 15 minutes away. Once you live here you are spoilt for life. Hihihi, Sara, but it’s true! At least some years ago I saw it advertised. This must be the best-positioned Coop in the world, right next to the lagoon teeming with flamingos. But I didn’t go to this event, sounds a bit… impolite. 😀 Welcome to my new blog! The last photo is how I once saw flamingoes – the one and only time – from a great distance. Lucky that you were able to zoom in on them.